Hello crochet friends, are excited and prepared for another pattern .. Today's post is about animals and one of the sweetest things to do, there are no ones who do not love. If you are looking for something different and fun to do this in the right place, especially if you are looking for amigurumis to do. Today the pattern is going to be a lot of fun and cute to do. For all who love amigurumis how am I going to love this pattern. 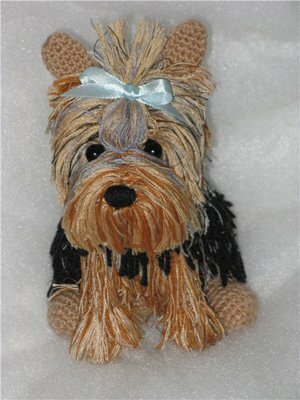 I'll share with you a beautiful, more specific Yorkie crochet dog. Ever heard of animal amigurumi? You've probably heard that name or seen some work like this because it's very well known and you're charmed by everyone, especially the kids. If you are just like me who is also passionate about this type of crochet work then you will love this super cute amigurumi pattern. Take your materials and let's learn and practice. This pattern is intermediate level but even if you do not have expexperience with amigurumis the dedication and persistence make and create beautiful pieces. The name amigurumi is given as a Japanese technique of making crochet dolls, this term comes from the junction of two words meaning toy plush. The crochet has always been updated, no longer a thing of grandma and conquered everything and with it beautiful new patterns like that. This pattern is lovely to decorate the house, the room or even sell, people like to take advantage to have an extra income. 2 round black shank buttons, such as Slimline Buttons Series 1-Black Shank 3/4"
This pattern of dog amigurumi is very beautiful and charming, I have photographed him ready up and also left below to help and see the result and inspire you more and more. Patterns of amigurumis can not be liked, being a great tip for a birthday present, Christmas at last. Gorgeous gifts and still made by yourself. 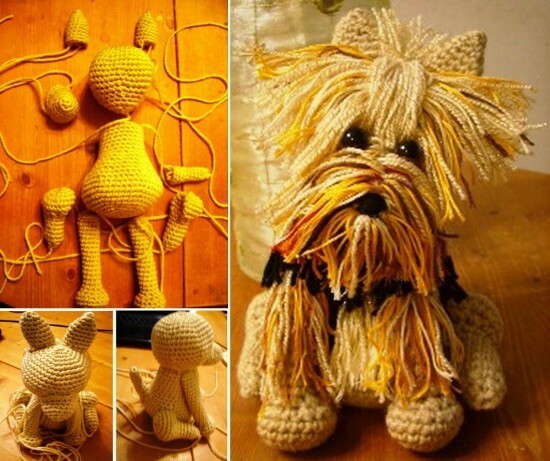 Below I leave the video tutorial of this wonderful crochet dog tutorial with all the step by step explained and shown in the video, so it is better for you to go seeing with it, being able to pause and return when you want, being better to take all your doubts. Enjoy our fanpage Xell Crafts and stay inside our news. To the next.